Norway Maple (Acer platanoides) never reached Britain as a native tree after the last ice age, being introduced in the last half of the 15th Century. It is a native tree in Norway, including much of Europe to the Caucasian region. A widely planted tree because of its attractive shape and stunning autumn colour display, which see the leaves turning an attractive golden-red colour. A tree well-suited to dry and open parkland areas and will provide a focus of attention in a open woodland. Expect a final height of 28m (93ft). 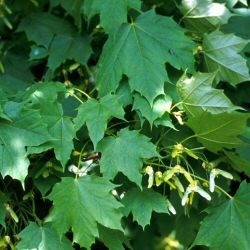 Typically, Norway Maple is planted in groups of between 10 and 25 trees. This number of trees is ideal for creating a wildlife habitat and a meaningful source of food and shelter. Spacing may vary between 1m (3ft 4in) and 5m (16ft 8in). The aim is to mimic what nature intended and thus avoid artificial lines. Blending of one species into another is suggested although bearing in mind different growth rates.